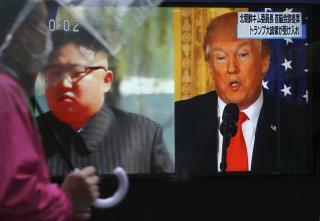 (Newser) – The Trump-Kim summit has been called off—but it's still a historic event for coin collectors. A commemorative coin produced by the White House Communications Agency to mark the summit between Trump and "Supreme Leader" Kim Jong Un is now in high demand and is expected to became a valuable collector's item. BBC correspondent Anthony Zurcher says it could become the "1804 dollar" of commemorative coins, referring to extremely rare and valuable coins that were used as American diplomatic gifts in the 19th century. The White House says the issuing of the coin by the WHCA, a military detachment tasked with securing presidential communications, was a routine event and it was not involved. The White House Communications Agency (WHCA) is a one-of-a-kind military unit dedicated to providing premier, worldwide, vital information services and communications support to the president and his staff. They provide assignment opportunities for service members who are self-motivated and seeking to grow both professionally and personally. Operating in a fast-paced, dynamic environment requires a team of dedicated, highly competent professionals — WHCA's soldiers, sailors, airmen, and marines are the best of the best. Their assignment to WHCA identifies them as leaders qualified to work in direct support of the President of the United States. And Trump continues to steal from the deplorables because these coins he minted will be as worthless a Trump U diploma! Happy there was no Obama-Kim one! That would of been WORTHLESS! worthless~without worth; of no use, importance, or value; good-for-nothing: a worthless "NO LEADER' President. Who got a Noble Peace Prize They should take it back. So Please Keep calm & Eat ice cream now for those 8 years of a NO LEADER. Thank You.